“And squat, and jump, to the left, to the right, and jumping jacks now” the overzealous aerobics instructor screamed to the sound of high-energy music. 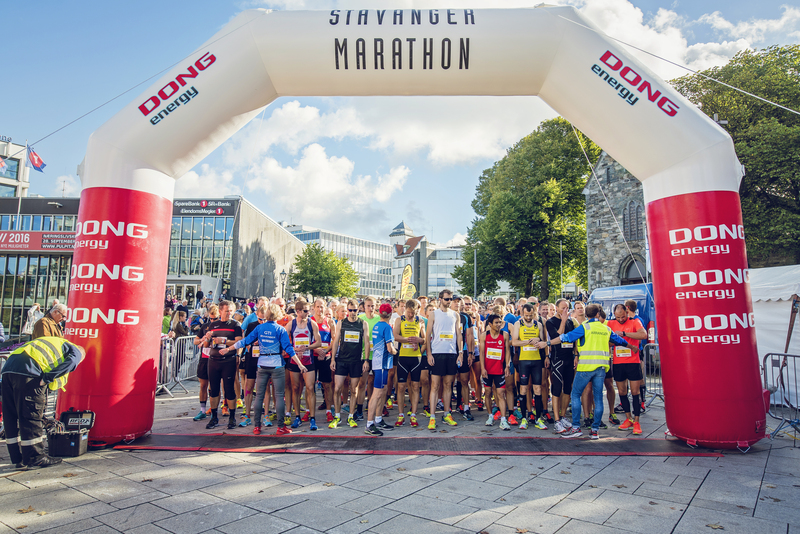 In a corner of the starting pen of the Stavanger half marathon, I hid, shying away and pretending to stretch against the barrier, desperately trying to get my breath back. 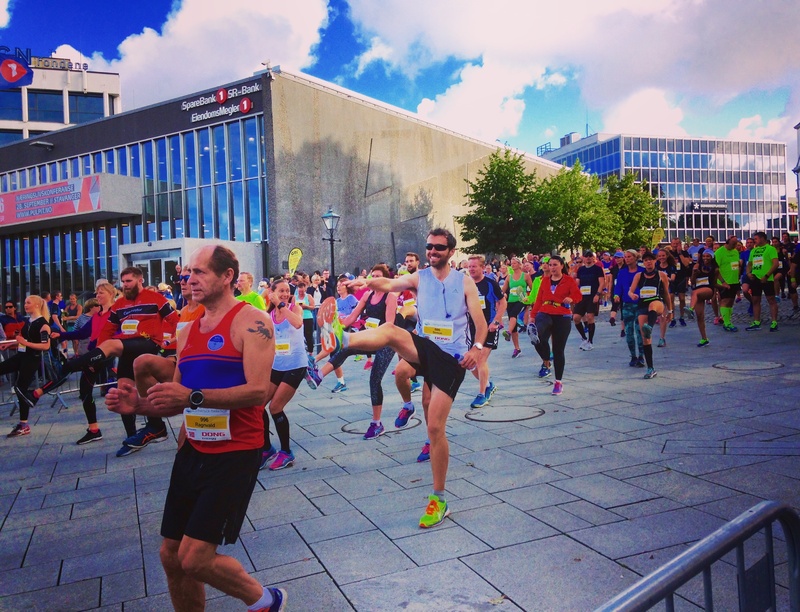 It’s traditional in most races to have a bit of an organised warm-up session to get the blood pumping. Here, a full 15 minute intense cardio session was a little more than I’d banked for and, with my heartrate racing through the roof, I coyly chickened out of the organised fun. 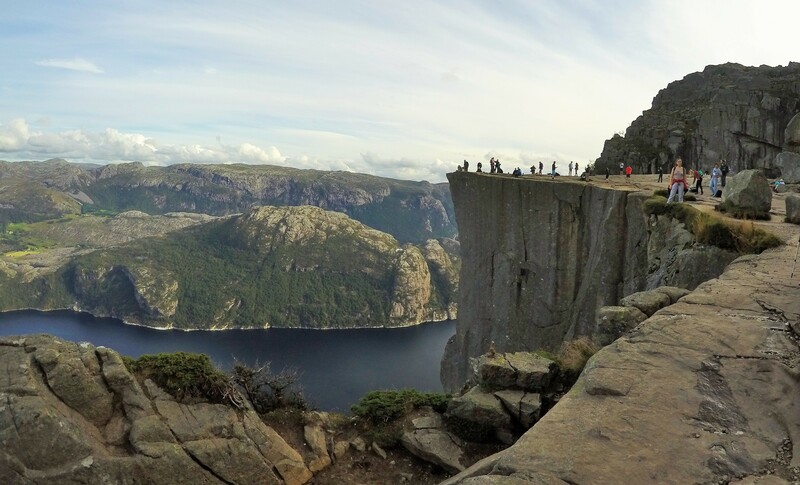 Stavanger is a small pretty coastal town in south-western Norway, surrounded by fjords. Originally a fishing town, its wealth exploded along with Norway’s with the oil boom in the 20th century. Now, it’s known as one of the most expensive cities on earth with more Teslas than I’ve ever seen. 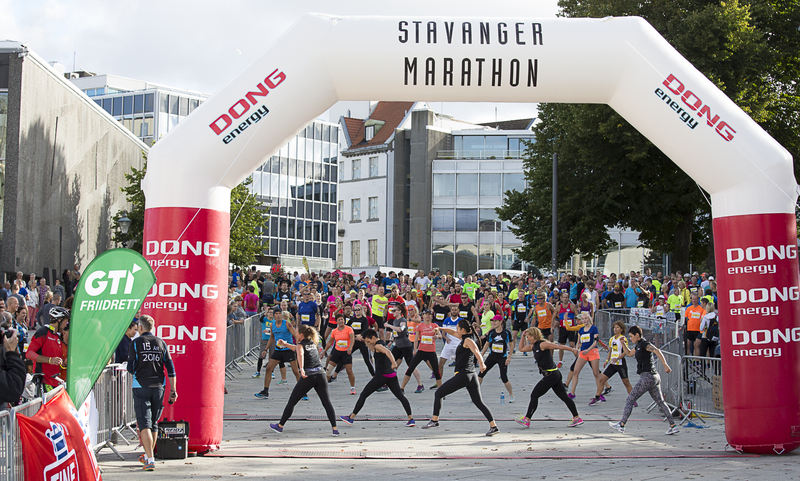 This race has been going for a few years – the standard is reasonably high, though the turnout across all three races (10km, half-marathon & marathon) isn’t huge: maybe only 1,000 people. 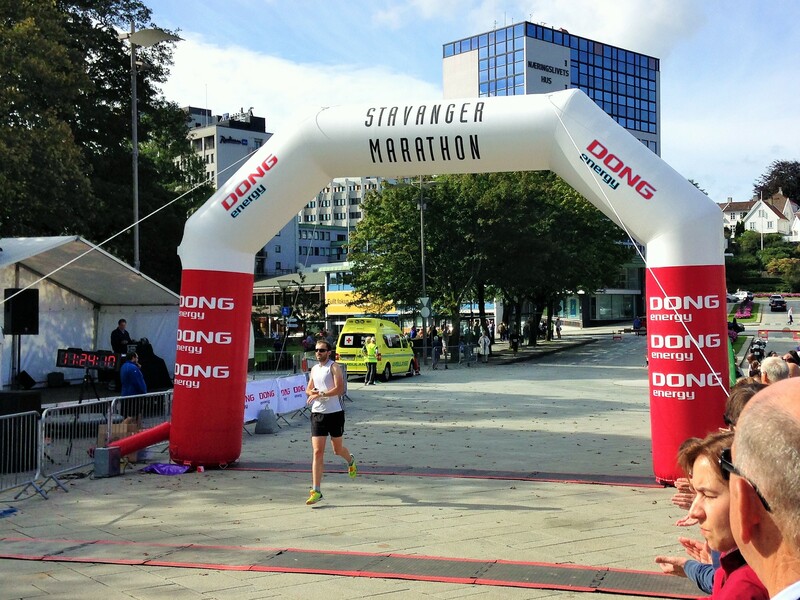 The race was well organised – I was a bit uncomfortable at the bag drop which is open access with only blind trust protecting your bag from thieves. However, in a city with only 2% unemployment with very limited crime, the risk remained low. Anyway, back to the race. After the impromptu bodypump session and a bit of shuffling to the front line, the gun went and we were off under glorious sunshine. It would be a bit of an exaggeration to describe the course as hilly, but ‘severely undulating’ is probably correct. I discovered this in the first 200m, which was essentially one constant, S-shaped, steep incline and stretched the field out pretty rapidly. I briefly joined the lead 5 runners for the first couple of uphill kilometres, before realising their uphill pace was my 5km flat pace: if aerobics was out of the question, then this definitely was! 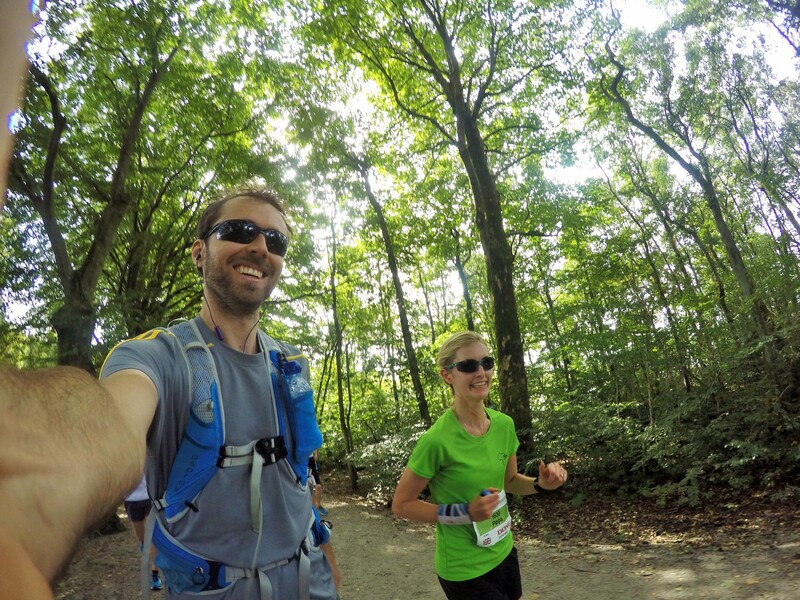 The climb ended, my pace evened out and we entered the leafy Våland park to run along gravel paths for a while. It should be said at this point that the route isn’t sealed off at any point which, despite the low-ish turnout, is quite unusual. Some families walked by, some dogs ran along –one slightly confused man mowed his lawn, probably wondering what the hell was going on. The support was sparse, at best, but the pleasant scenery made up for it. 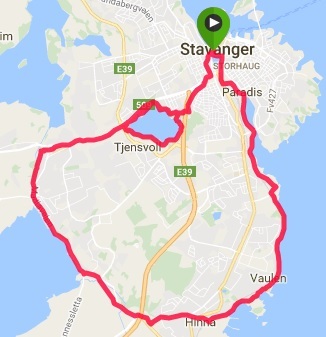 Soon, we exited the park having looped the Mosvatnet Lake and ran past the Stavanger Conference centre, a fairly unattractive building lining a motorway. 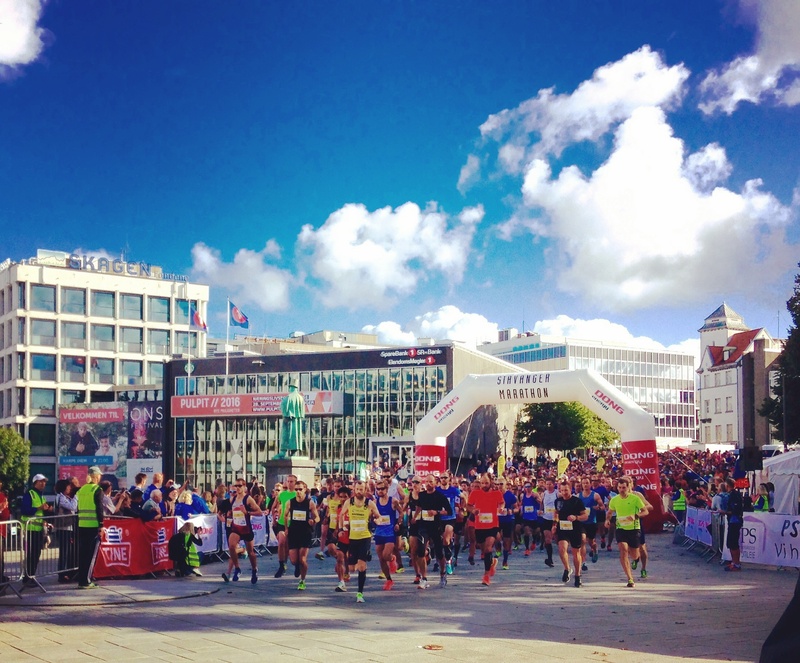 This, for sure, wasn’t the prettiest or most exciting bit of the race and I picked up my pace – a surge I wasn’t expecting, and overtook a few runners, including one from Clapham Chasers. I can fly 1,000 miles but I still can’t escape our running neighbours! As we progressed along the tarmac, I started overheating in the midday sun. However, despite the oil link, I knew this was Norway, not Dubai, and the air genuinely wasn’t THAT hot, only my body was. I needed to get over it, and the upcoming water station seemed like the perfect opportunity to cool down. I eagerly grabbed a cup and poured it over my head, happily anticipating a cool trickle of water down my back. Gradually, as it hit my lips, the distinct sugary and orange-flavour grew. 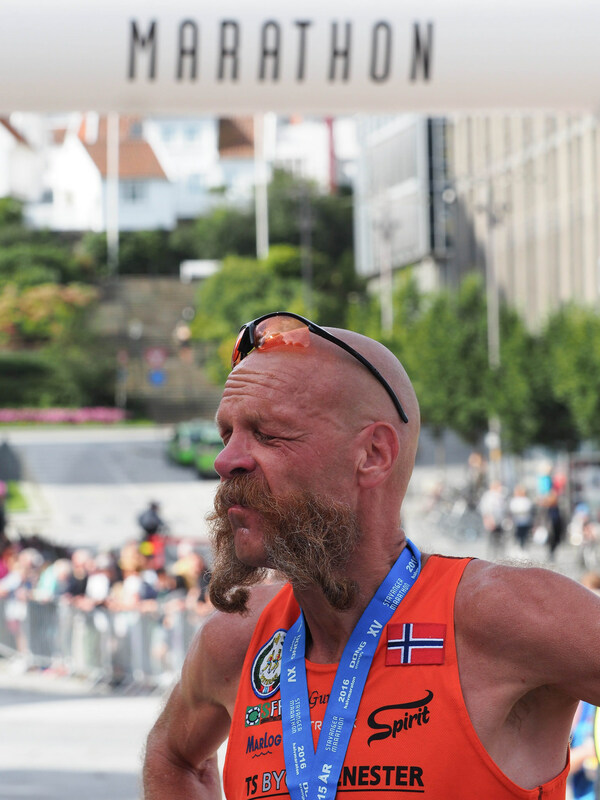 Slowly, but surely, the realisation dawned on me that my scalp was becoming encrusted with a particularly unwelcomed thick layer of sticky, sugary, energy drink – something which I won’t be the first, or last, runner to do in a foreign race. Still, it did the trick and I was cooler! 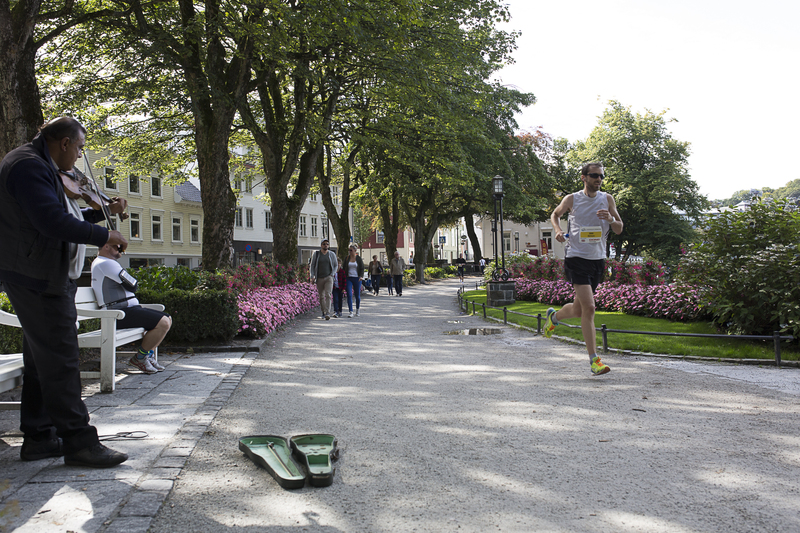 Being serenaded around Stavanger … sorry, no cash mate! 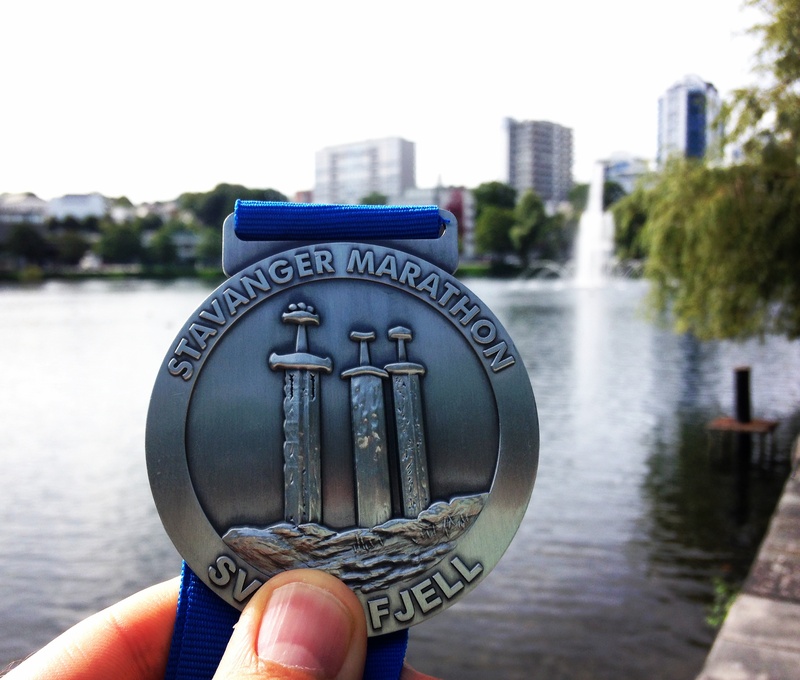 After 8km, we reached a bay on the North Sea and ran past Sverd I Fjell, a large peace sculpture made of three 10m high swords representing the millennia old union of Norway. I don’t remember much of the sculpture, other than it was big, but I was overwhelmed by the potent smell of seaweed along the coastline – bleh! I crossed the 10k mark in 38.36, already behind a sub-80 target but decent for sub 85 finish, which was my minimum standard for this course. After 11-12km, we started another gradual, slow incline for the next 2 kilometres. Once again, no walking sticks were required but it was enough to get your hamstrings whinging. 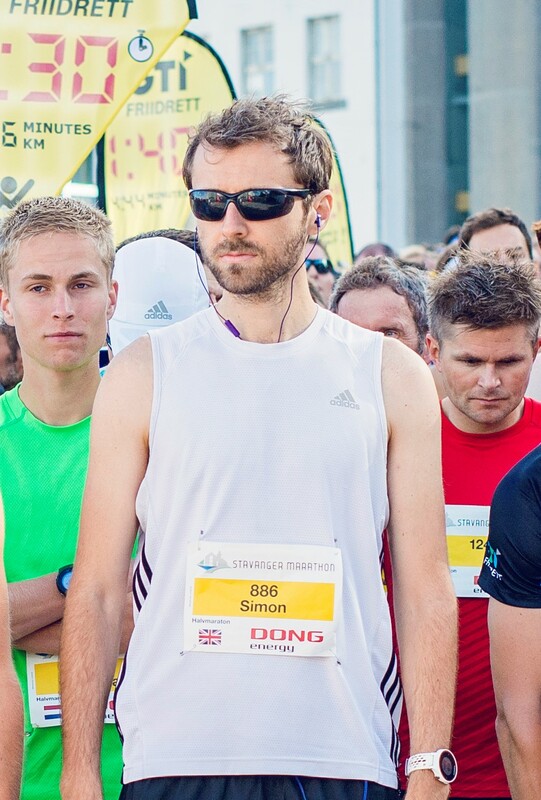 My legs were beginning to tire, and a handful of runners started overtaking me every kilometre or so. 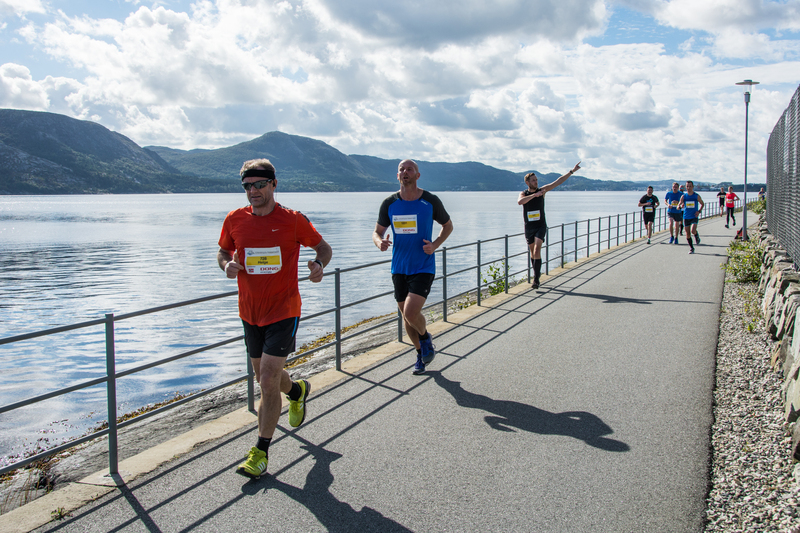 I managed to more or less maintain pace until the fourteenth kilometre, which then involved a 5km run along the fjord in full sunshine. In many ways, it was idyllic. In other ways, my lactic acid levels really were going into overdrive and a straight road cut off from the town by the railway line with zero support wasn’t exactly top of my wish list at that point! The view was breath-taking mind you, though, admittedly, I possibly wasn’t paying as much attention to it as I might have in other circumstances. I clocked my 18th kilometre in 4.22, an inexcusably slow kilometre for a half marathon and a good reminder of how much I still need to train before Frankfurt marathon in 8 weeks’ time! Eventually, we were back in town. 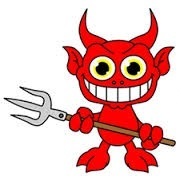 After one final climb (past a cemetery…no joking please! ), the last kilometre was, much to my relief, downhill. We went past one of the twenty three 6ft5 cast iron statues by Antony Gormley (he of the Angel of the North fame) which decorate Stavanger – their haggard, worn-down, faces all staring aimlessly out to sea; a feeling I shared as well as, I suspect, a look. With one last push, I increased my lead on my tailgater and crossed the line in 19th with no one in sight either in front or behind. 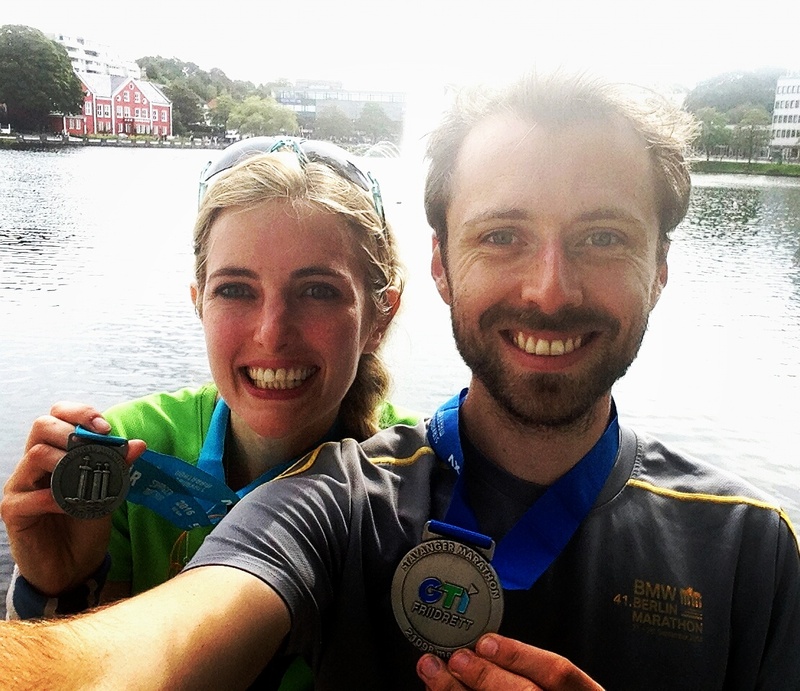 Overall, it was a good early workout ahead of the autumn marathon season and the fjords really are stunning (when not running). As I caught my breath post-race, I received a warm embrace from Pippa, until the stick goo, by now half way down my back, started coating her clothing. Note for next time: water in Norwegian is ‘vann’. Energy drink is ‘energidrikk’. Sticky. Blindingly Obvious. Point. Taken. Very random but just stumbled across this blog via the american runners world forum. I am the guy in that Chasers vest! Haha. Small world. Haha small world indeed! Nice to hear from you!